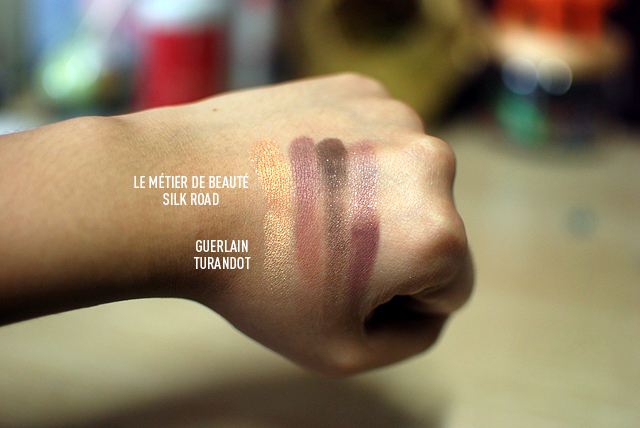 Today’s post is a quick comparison between the Guerlain quad in Turandot from the Holiday 2012 collection and the Le Métier de Beauté Kaleidoscope Eye Kit in Silk Road from the Fall/Winter 2011 collection. Turandot ($59) is part of Guerlain’s permanent line and Silk Road ($95) is limited edition. I don’t think you can get it anymore, but if it helps, I got it from Neiman Marcus. 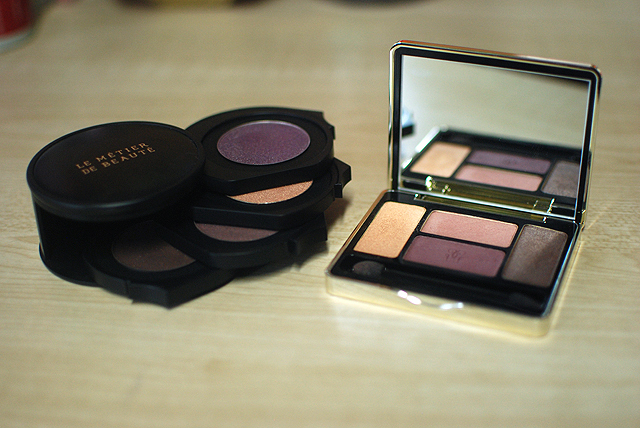 I noticed some similarities between these two palettes when I had already gotten them. I put off swatching them right next to each other for the longest time because I didn’t want to admit that I might have gotten two identical high-end eyeshadow quads. Thankfully, they are different enough for me, personally, to not feel bad about purchasing both. Both are limited edition. ETA: Turandot is not limited edition. Guerlain is cheaper at $59 but it comes with less product. I do like the more stark variation of Turandot when it comes to finishes, but I appreciate the “technology” of Le Métier de Beauté eyeshadows in that layering them yields different colors and effects. Both seem to be perfect for warm-toned ladies, but Silk Road seems to be a tiny bit warmer, so maybe that might be helpful for you, in the offiest off-chance that you are picking between the two. Guerlain’s animal testing policy is a little vague, stating that “no products put out in the market are tested on animals,” which means that it could still be testing its ingredients on animals. Le Métier de Beauté is cruelty-free. Read more about my personal cruelty-free pledge here. Ahhh did you just show me two beautiful LE products, Carina? I passed on Turandot because I thought the shades would be too warm for me, but both quads look so lovely on you!!! I’d go for the Le Métier one. I love everything about it. The shades, the pigmentation, and also definitely the packaging. They are both so beautiful. Dosnt layering any shadow create “different effects”? The LMdB Kaleidoscope is supposed to create depth and complexity (using a contrast of warm and hot colors) when you layer them. The Guerlain just looks muddy when layered. Turandot is not LE so you can look for that! 🙂 Hopefully Guerlain eyeshadows work well on you! LOL. Very good thing they aren’t identical at all! I really like the LMdB palette. So sad, right? Hahaha. 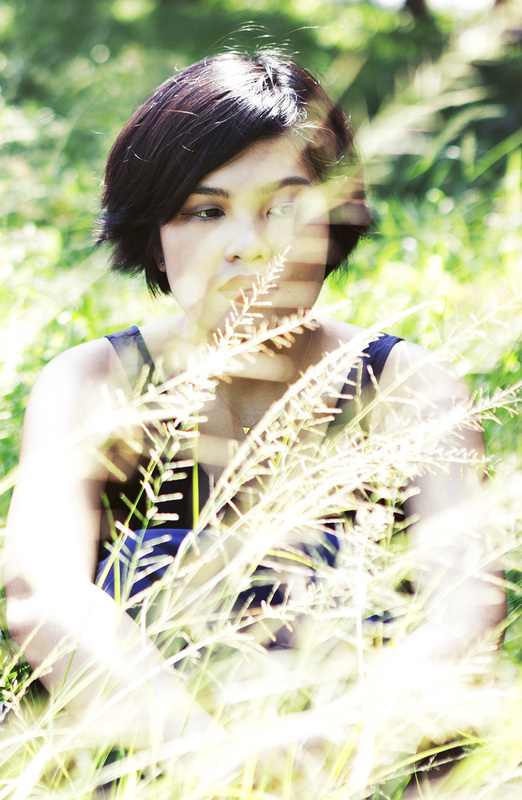 I really like LMdB shadows. ;_; I just got my hands on their Spring 2013 palette and I am over the moon and also sad because it’s basically sold out everywhere and the shadows are the size of pennies. Stupid question, but did you bid on it? Loved Turnadot after Temptalia reviewed it, but I don’t think I’ll be buying it while I’m still a student. I understand! I don’t think I would have been able to when I was studying, either! But so tempting. It’s incredibly pretty!